Similar reports of colored mountain snow have been around for millennia. In fact, Aristotle mentions pink snow in his book The History of Animals over two thousand years ago. More recently, hikers and mountaineers have started calling pink snow “watermelon snow” for its color and the fact that it allegedly sometimes smells like the fruit. It wasn’t until the late nineteenth century that scientists finally discovered the cause for this pink mountain snow: microscopic plant-like microbes called algae! Watermelon snow has gotten a lot of attention recently due to the fact that it contributes to melting glaciers and rising sea levels. If you have ever worn black clothes on a hot day, you probably have a sense for how this works. Darker colors take in more energy from the sun and therefore reflect less light energy to your eyes or back towards the atmosphere. As they take in energy, dark clothes heat up, making you feel warmer than you would if you were wearing light colors. Likewise, the pink snow takes in more light energy than white snow does, making it heat up faster. But why is the algae pink? Most of the time, when algae grows in ponds and rivers it has a bright green color, and in fact, you can sometimes find green algae deeper down in the snow. Is there something about this environment that makes it beneficial to be red? In their recent paper, Roman Dial, Gerard Ganey, and McKenzie Skiles set out to answer this question. The basic premise of their study is that this rainbow of different colors of algae all have basically the same requirements as any other rainbow: light and water. Algae use light, water, and carbon dioxide in the process of photosynthesis, which allows them to make their own food. But in the dry snow on a glacier, liquid water is hard to get. To avoid freezing to death and to find the water they need to stay alive, algae have adapted to melt the snow around them using colored pigments called carotenoids. Building off of this fact, Dial and his colleagues concluded that algae that are able to melt the most snow without overheating will “win,” and their genes will be passed on to the next generation. Dial and his colleagues then created a model to see how much heat would be produced by spherical cells of each color. They operated under the assumption that each cell absorbs all wavelengths of visible light other than those wavelengths reflected as its color, and they tested six recognizable colors: red, orange, yellow, green, blue, and purple. Based on their initial model, Dial and his colleagues found that purple-colored particles would melt the most snow or ice. This is interesting because most snow algae is red (not purple), although purple algae is sometimes found on ice. However, thinking more about the model, the researchers realized that they also needed to take into account one more factor. Energy can be transferred to the snow directly as heat, but if a particle also reflects light to the snow, that can cause the snow itself to absorb more light energy and heat up. When they added this into the model, purple and red had almost the same ability to melt snow, while all other colors were much less effective. In theory, this does a pretty good job of explaining why snow algae are the colors they are. But how well does this hold up in real life? To test this, the researchers did one more experiment: they got a bunch of carpenters marking chalk in red, blue, and black, and used a flour sifter to spread it out in the snow. They then measured how much of the snow melted over the course of a week for each color of chalk. Ultimately, these results supported their model by showing that the red chalk melted far more snow and ice than the blue chalk. 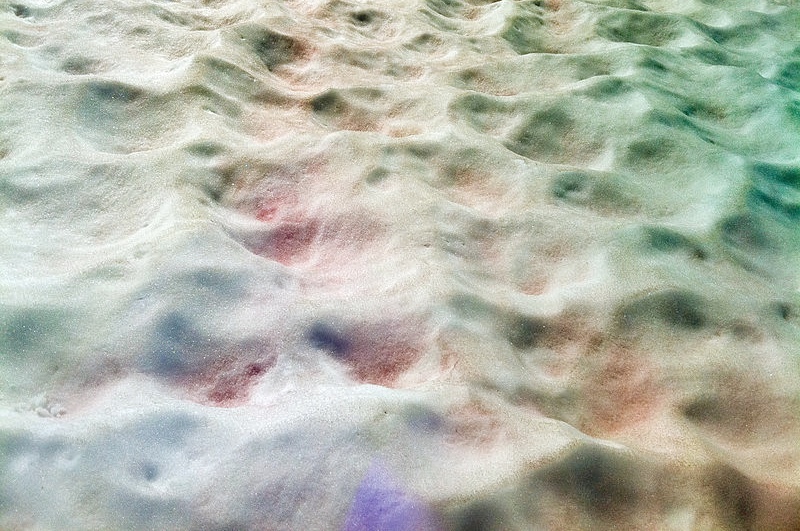 From this study, it seems that red snow is likely the most adaptive color for snow algae because it melts a lot of snow without causing the cell to overheat. Darker colors like purple may be more beneficial in environments where overheating isn’t an issue, like for cells that are directly pressed against a flat surface of ice. Similarly, in environments where the cell doesn’t need to melt snow to get enough water (like ponds or even wet snow), cells can avoid producing these pigments altogether and only absorb the color needed for photosynthesis, making them a green color. It took thousands of years for people to discover that algae are the cause of this mysterious colored mountain snow. Now, finally, Dial and his colleagues have begun to pinpoint exactly what function the color serves. Next time you go hiking in the mountains, see if you can spot some watermelon snow for yourself! And, if you are interested, you can also get involved with research on snow science yourself by collecting a sample! To learn more, check out the Living Snow Project at Western Washington University, or go to https://scistarter.com for other citizen science opportunities near you.